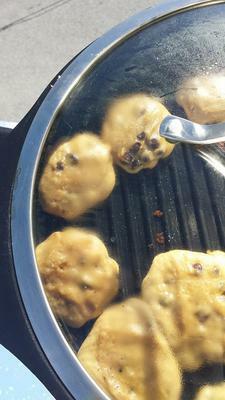 I have been asking friends for things they would like to see cooked on the solar cooker. 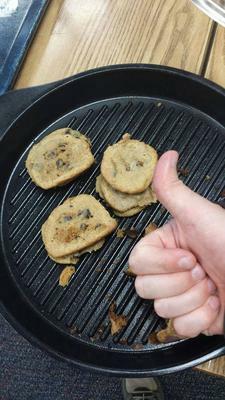 One mentioned "Cookies" - - I wasn't really sure if I could make cookies in a skillet, since I've always been under the impression that they were baked. Either way, I was going to give it a shot. Challenge accepted! I did a quick internet search to see if this had been done before. After sorting through some very interesting ideas (like cooking a hot dog with nails attached to a cord plugged into a wall - ill advised!) I came across this gem. So, apparently it IS possible. I gave it a shot. A few brave test cookies made the ultimate sacrifice before I felt I had cookies that I could share with others. After that, I turned them out of the sun and let them "bake" with the top on for a few minutes. The residual heat cooked the tops of the cookies the rest of the way. One thing that I liked about these cookies is that while they were too goopy to turn with a spatula, they ended up with crispy bottoms and chewy tops. It was a nice contrast. I wouldn't call this a total loss, my friends and I still enjoyed eating the interesting looking cookies. However, I still have a long way to go in terms of perfecting the skillet-cookie creation process. My new long-term goal is to find a set-up that will allow me to do a little more baking with the SolSource. If you have a SolSource, or are interested in one, I suggest checking out their facebook group! There are a lot of people on there playing around with various ideas. 1.) Pay more attention to changing the heat settings (i.e. fiddling with it) - either rotating the SolSource so that it isn't in direct sun, or moving the focal point around. 3.) Find a pan setup that will allow for a less goofy baking setup.